It started in 2005. 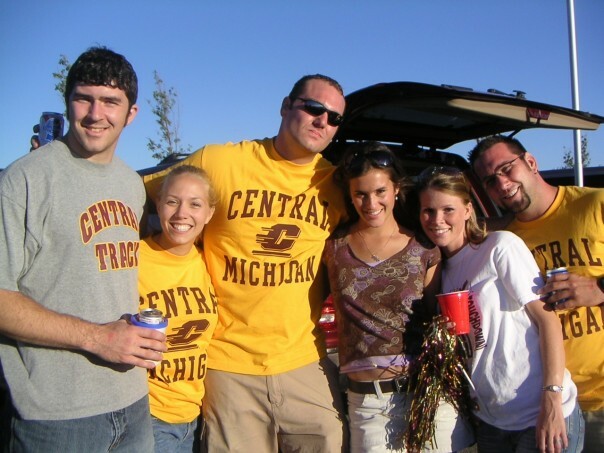 Michael Marsh (MM for purposes of this story) and I met in the spring at His House Christian Fellowship on the campus of CMU, where we both attended (He is Canadian and had a track scholarship). We hit it off straight away. It just so happened that around the same time I had decided to go study abroad in Dublin, Ireland for the fall semester. We were head over heals. Unfortunately we spent only a couple short months in the same town as I worked in west Michigan that summer as he went back to Canada to work. I spent the fall 2005 in Ireland pining away for him and once I came back he proposed. The was actually a long process he started back in July that involved daily cards that I read and a poem that took me 3 months to decode. As the planning started and our spring 2006 semester continued things were somehow falling apart between us. On our first pre-marital counseling session with our pastor it was concluded that we were not ready to get married. I walked away hyperventilating and crumbled to the ground. I was devastated. The next day our engagement was broken. I got an apartment by myself and continued working through the summer, hoping things would get better once he came back for his final year of school. It didn't. I moved back home with mom and dad. We didn't communicate after that. A few short weeks later I landed a job with a fabrication plant as the Marketing Coordinator. A few short months after that I met Michael Purcell (MCP for the purposes of this story). He worked for the company that supplied the machinery for the company I worked for. He was the service tech and he hated it. Our relationship, however, was great and progressed quickly. We took a trip down to Austin, Texas to visit a couple friend of his. We fell in the love with the city. Neither of us wanted to stay where we were either in our jobs or geographically, so we decided to up and move together, leaving everything behind in pursuit of a new, fresh life. Just before this move, he proposed on Christmas Eve 2007. I said yes. We moved down south, found an apartment, and a few months later we found jobs in exactly what we were hoping for. He as a successful animation artist and myself in marketing. That August (31, 2008) we flew back to Indiana and were married. Soon we were saving up and bought our first home in NW Austin. It was a dream home for us. A forever kind of home for most. Not long after MCP bought a new (to him) car, a Honda S2000. A black convertible, which he assured me was safe. Life was good. Until the worst day of my life. Monday March 22, 2010. It's burned in my memory forever. It was around 9:30pm and three police officers were at my door. MCP had been killed in a car accident coming home from work at 5:30pm. It took them nearly 4 hours to tell me. My life is a blur past that point. Two memorial services, 3 months with a lawyer sorting everything out, selling the house, and quitting my job, needless to say I was not running on my own strength. At some point during all of this, among the hundreds of condolences, I received a message from MM's dad. I had no communication with either he or his family for 4 years up to this point. This was the door that reconnected us. Our first conversation was 5 1/2 hours long. We had a lot to catch up on. We finally saw each other in person when he flew down to Austin for (literally) 48 hours during a weekend off. Unfortunately for him, I had chosen to leave my life in Austin behind and again travel to Ireland to spend time with a friend and help her for 3 months with her (at the time) 3 month old babe while her husband fulfilled a fellowship in Paris. In the time I spent in Dublin both my mom and MM came to visit (separately). Just before doing so, MM bought a house in preparation for our new life, hence this blog! MM and I traveled to west Ireland as well as Paris. 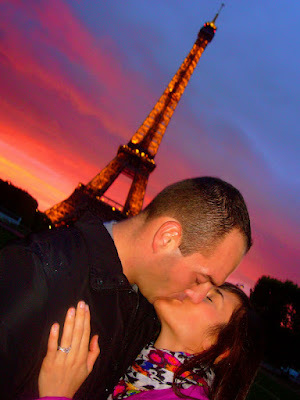 It was on the top of the Eiffel Tower that he proposed for the second time, with a ring he designed using the same center stone as the first engagement ring. 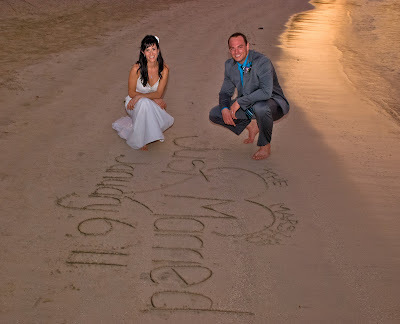 We were married on Thursday January 6, 2011 at The Royal Decameron Club Caribbean in Runaway Bay Jamaica. We had an absolutely perfect day and couldn't have asked for better. Our close family and dear friends Meg and Brad joined us to celebrate our very important day. We are forever grateful and thankful they were there to support us and our new life together. A link to our wedding photos is ready! Click here. Just a short month following our wedding we found out we were pregnant. October 15, 2011 our beautiful baby girl, Paisley Kariann was born. God is good. I don't understand the why and how of life, but I trust he is the one in control. And that's my story... so far! either you weigh a pound or he throws like hercules . . .guess when you miss spell a word and remove it to fix it, it still shows!